This is the first Adult tournament we have ever run at Doubleroo so there are some things one can only learn from experience. 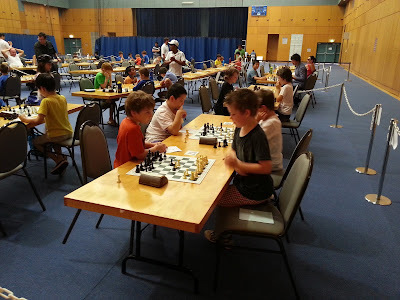 I just learnt the value of "Sophia rules" Since I wrote the title of this post the "crunch" game between the sole leader Brodie McClymont (5/5) and pre-tournament favourite and Queensland's highest rated player, Moulthun Ly (4/5). I was expecting a hum-dinger of a game as Moulthun needed to win with black to stay in the hunt for 1st place. 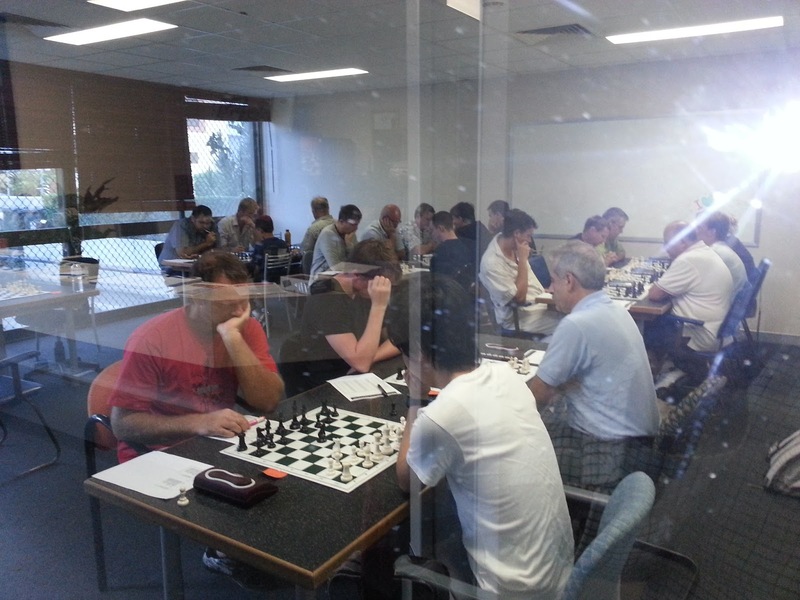 Instead the players agreed to a draw in 14 moves. In a Roman Colosseum they would have been flayed alive by the spectators but because it is allowed under standard chess rules they did nothing wrong. The next tournament held at Doubleroo will have "Sophia rules" There is no draw by agreement allowed. Today was the last day of the Junior Championships at Bond University on the Gold Coast. I did really want to go down and watch the exciting final day. Luckily I was able to follow the results on Tornelo at least, a poor substitute for being there but better than nothing. The U18 was won convincingly by Queensland Junior Gene Nakauchi with a very imressive 8/9, two points ahead of the field. All results and games can be seen on the Tornelo site. Would you like to see one of Brigittes games? I thought so. The other tournament to finish later today is the Tata Steel tournament in Wijk aan zee in Holland. This tournament features the strongest players on the planet and Holland's best. The site has all the games with analysis and commentary by the players themselves. Highly recommended. 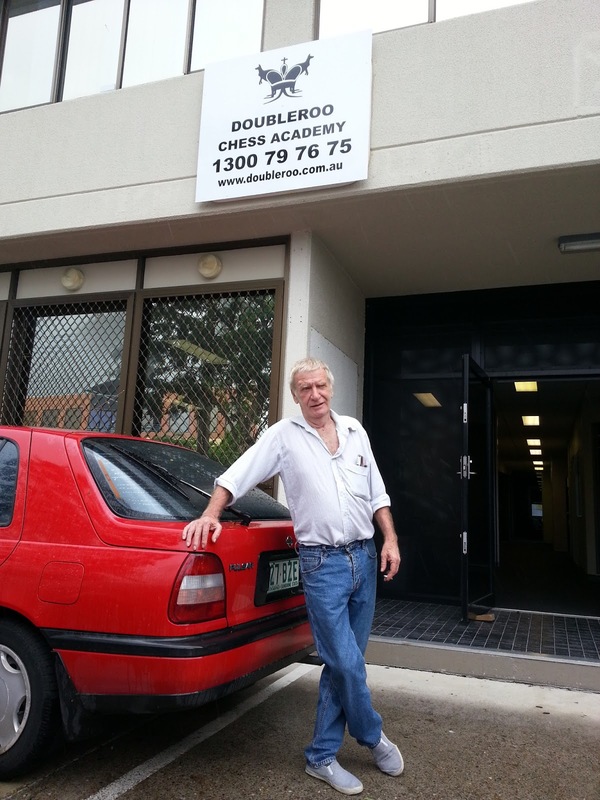 The Doubleroo Australia Day Weekender was conceived just a few weeks ago in a phone conversation with CAQ president Mark Stokes. I wanted to bend Mark's ear about having a nine round, one round a week on Friday's tournament. What about the Australian day he asked? 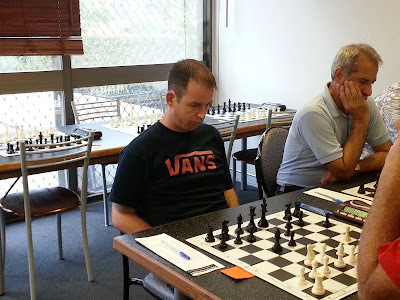 One particularly nice surprise was the appearance of several players who had not moved a pawn in anger for a long time like former leading junior, Jakob Edwards, Ross Jempson and Don Hamilton. The highlight of the day was when a man in his late twenties, Matt Watson, told me that I had been his Chess teacher at St Kevin's College more than a decade ago. We also managed to attract the strongest Queensland chess-player, International master Moulthun Ly. He had a relatively short first round against Craig Stewart who bemoaned having lost in a similar method just recently. When I was a teenager, about the same time as the Dinosaurs roamed the earth, Queensland had a very active chess scene. I and my friends used to travel up to play the circuit. John Myers was the one player we all feared. He was a legend thirty years ago and can still spot any combo instantly despite having hung up his pawns years ago. He graced us with his presence as a spectator today and we all appreciated his insights...although he did try to kidnap several players to go to the pub. Breaking news!!! Jakob Edwards (1917) just beat IM Moulthun Ly (2440) throwing the tournament wide open! I will try to bring you the game later! 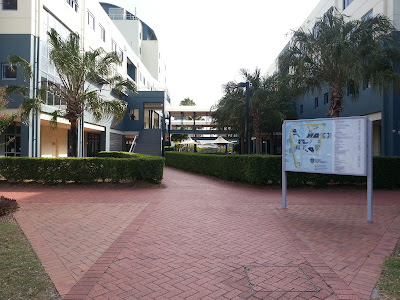 This year the Australian Junior is being hosted by Bond University on the Gold Coast. An excellent venue in every way. This is the main entrance, the playing hall being on the first floor, left hand side. which could accommodate many times the number of participants present. This is actually baffling to me. 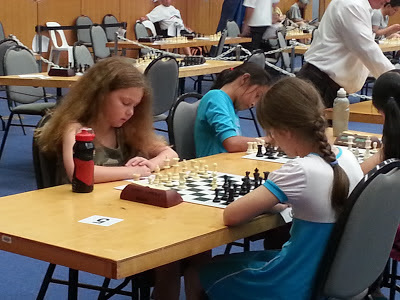 At our local school competitions during the year thousands of children take part and now during the holidays the National championship is in our area, at a great venue, excellently organised (as usual by Gardiner Chess) and only a handful of locals are playing. Focusing on the positive, this gives coaches plenty of time to sightsee. 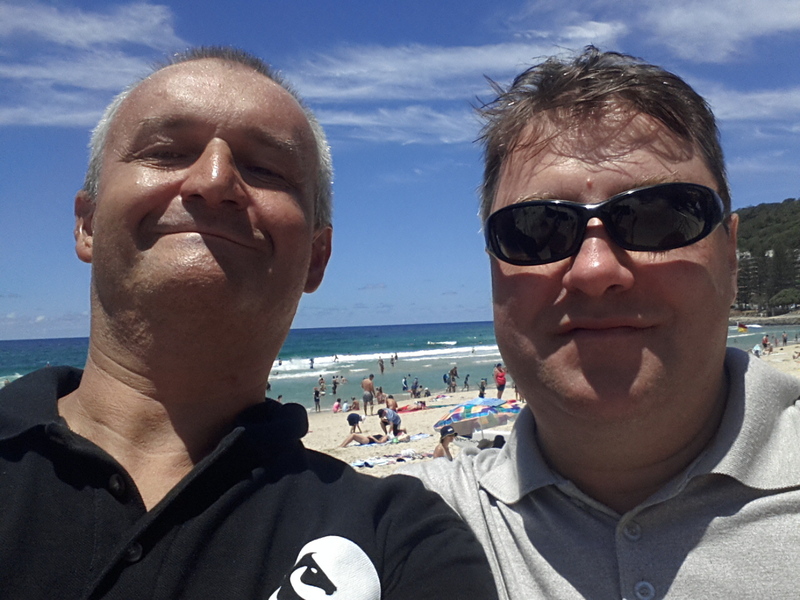 Leonid Sandler, ex-Soviet power-broker and current VP of the powerful ACF enjoyed our trip to Burleigh heads for a swim. Leonid is not only coaching Victorians but also some of Queensland's bright young stars. Speaking of Queensland's bright young stars, here is the crucial encounter of the Australian lightening championship. locally known as New Zealand, his major success since moving to Melbourne was winning the World U12 championship. I must admit that I have not been paying close attention to the games of Australia's top young players, or anybody's games for that matter, so this game came as quite a surprise to me. The opening was quite common although Igor Khenkin embarked on an aggressive variation that does not have a great strike rate according to my database. Igor's 12...e5 is a novelty but has a rather pungent aroma . The position had occurred twice before, one with 12...g5 and the other time 12...Qh6. The latter would be my choice. It is one thing to feel that a move smells bad and quite another to show why. Bobby's regrouping Bc2-b3 and Nf3-e1-d3 would have come to nothing if not for the brilliant 18.Be5!! If white had nonchalantly played 18.Nd3 immediately black replies ...Bc4 with a smile on his face. Enjoy. We are moving soon to a bigger, brighter, more central venue in the middle of the city of Brisbane, Albert street to be exact. But before we move we will hold one more event at Milton, the Australia Day Open Weekender! 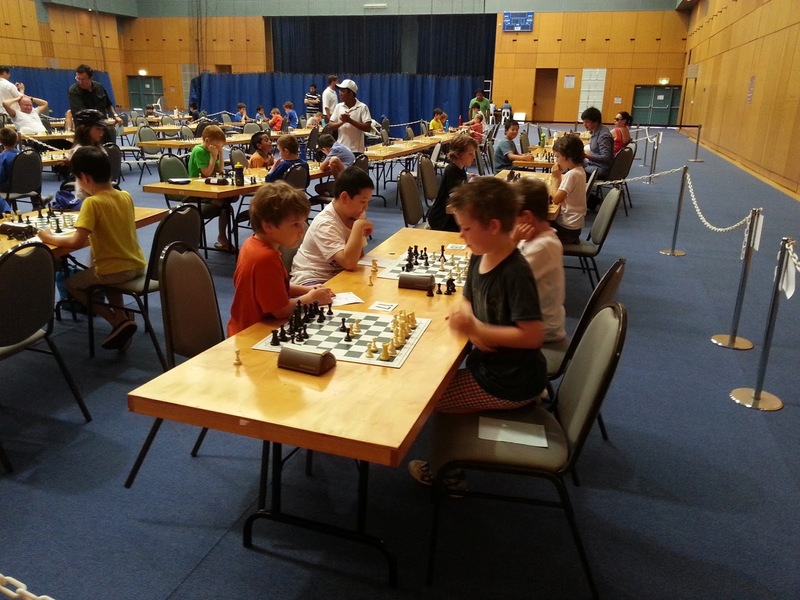 This will be a perfect time for Adults to play because most of the dangerous juniors will be playing in the Australian Junior Championships. If you have not been playing lately because you got tired of losing rating points to little monsters then this is the tournament for you! For info and entry form click here. Strange, the things that can affect one strongly, bring back memories of childhood or just inspire. 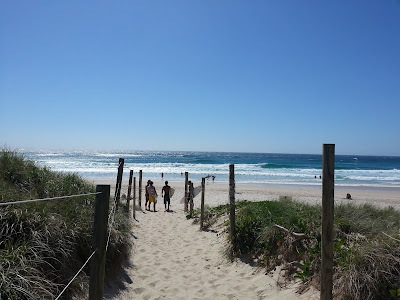 This morning I was advised by a local Byron surfer to go to Tallows beach instead of my regular spot, Wategoes. There was a northerly blowing and that meant that the waves were best at Tallows according to Bobby, who migrated to Australia from Canada decades ago for the surfing and lifestyle in Byron. Bobby had already been surfing at 5am as he does every morning. Well the waves were spectacular. They were breaking left and right from a sandbar at just the right height and speed for body-surfing. Although I go to the beach as often as possible I have not experienced waves like today for decades! Music is another speciality of the Shire (Byron Bay) and on Saturday I got to see Rapskallion, currently my fave band, at the Byron Bay Brewery. And this is the encore band presentation, the last song of the night.